This Knap & Vogt Single 20 qt. Platinum Trash unit with Pull-Out Steel Cages features Soft Close technology. The pull-out system installs with 4 screws (included). The unit holds one generous lidded 20-quart bin on a pull out system. The Enviro World 55 gal. Recycling Bins Blue combine toughness and economy in a large capacity unit.. Sleek flat back square design fits naturally in any location, High quality injection molded easy to keep clean and look new year after year. The Enviro World 55 gal Bin is focused, for two reasons: it allows the unit to hold a large capacity in a small footprint, and the units can be stacked together for transport or storage. This 20L medium size swing bin is perfect for any area in the home and makes waste disposal easy. Made with quality plastic for durability. Easy to clean with a damp cloth. This Real Solutions by Knape & Vogt 30.3 L chrome trash can is door mounted for easy access. The lid will open on it's own when the door is opened. Units mounts into most frameless and face-frame cabinets with block (include) for face frame applications. The unit features a bag-clamping ring to hold trash bags in place. 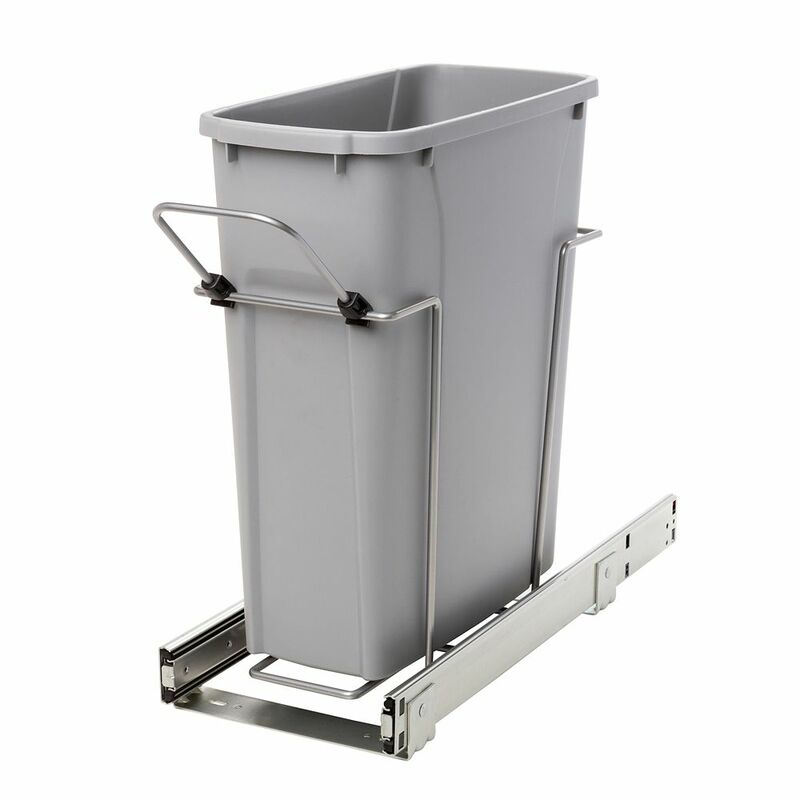 Knape & Vogt's 50 quart waste bin is an ideal replacement for any Knape & Vogt pull-out trash unit that utilizes 50 quart waste bins. Its durable plastic construction is easy to clean. The modern styling integrates nicely with most kitchens. 20qt Bin Soft-Close Recycling Center This Knap & Vogt Single 20 qt. Platinum Trash unit with Pull-Out Steel Cages features Soft Close technology. The pull-out system installs with 4 screws (included). The unit holds one generous lidded 20-quart bin on a pull out system. 20qt Bin Soft-Close Recycling Center is rated 2.3 out of 5 by 3. Rated 2 out of 5 by John from Poor design The soft close makes it hard to pull the bin out because you’re loading the spring. The result is that the poorly designed handle keeps popping off. I ended up throwing away the handle and disconnecting the soft close. Only kept because it fit under the sink. Not worth the price. Rated 2 out of 5 by Cindy from Easy install, but a little unsteady overall, used the door... Easy install, but a little unsteady overall, used the door mount also. Rated 3 out of 5 by phstc from It's more narrow than I expected. Besides that, it's an ok Trash Can, not that easy to assemble, ... It's more narrow than I expected. Besides that, it's an ok Trash Can, not that easy to assemble, and a little piece came broken, not a big deal, it does not affect its usage.